Led by Raman Singh, the BJP has ruled Chhattisgarh for three consecutive assembly terms. 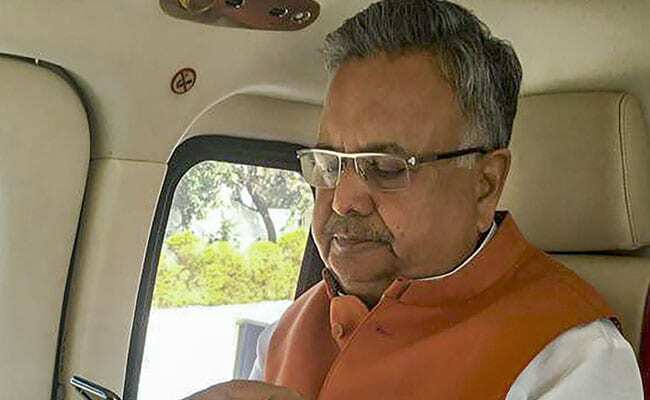 Chhattisgarh Election 2018: Raman Singh kept looking at his mobile to keep track of voting trends. A plough-carrying farmer needs an ox, not an 'elephant', Chhattisgarh Chief Minister Raman Singh said on Monday, taking a jibe at the newly-formed opposition alliance between Ajit Jogi and Mayawati, evoking guffaw from his supporters greeting him with monikers like 'Doctor Saheb', 'Mobile Wale Baba' and the most-famous one, 'Chaur Wale Baba'. As voting got underway across 18 constituencies in the state where Raman Singh has already ruled for a record 15 years and is making a strong pitch for another five-year term, Dr Singh embarked on yet another busy day of election campaign with public meetings across several constituencies, while taking feedback and holding review meetings whenever time permitted. While his own constituency Rajnandgaon voted in the first phase on Monday, the voting will take place in the remaining 72 assembly seats on November 20 in the second phase. The counting of votes will take place on December 11, along with that for assembly elections in four other states - neighbouring Madhya Pradesh, Rajasthan, Telangana and Mizoram. Chhattisgarh Chief Minister Raman Singh is popularly known as 'Doctor Saheb' being an Ayurvedic medicine practitioner. Led by Raman Singh, the BJP has ruled Chhattisgarh for three consecutive assembly terms ever since a resounding victory by his party ousted the then Congress leader Ajit Jogi's three-year-old government in 2003. Jogi has now floated his own party (whose poll symbol is a plough-carrying farmer) and has aligned with Mayawati's Bahujan Samaj Party (poll symbol elephant) for the assembly elections. The opposition parties claim there is a strong anti-incumbency wave against Dr Singh and they have alleged his government of having failed in handling the Maoist issue. In the outgoing assembly, the BJP has 49 legislators and the Congress has 39. The BSP has one legislator and one seat was won by an independent candidate. While the campaign ended on Saturday for the first phase of elections in 18 seats of Chhattisgarh, the poll fever is still running high with voting more than a week away in a much larger number of seats and the same was visible on a campaign trail of the chief minister on Monday. Dressed in traditional kurta-pyjama and a saffron coloured 'Modi jacket' the BJP's party symbol, the lotus, Raman Singh looked relaxed as he kept looking at his mobile to keep track of voting trends in his home turf and in other Maoist-affected areas. At least 12 out of the 18 seats where voting took place on Monday are considered to be affected by Maoist violence and tight security arrangements were in place in view of the recent spurt in Maoist attacks in the state. Raman Singh began his day taking feedback from his aides on polling and preparations for the day-long campaign tour in three constituencies including Bemetra and Gariaband. Popularly known as 'Doctor Saheb' being an Ayurvedic medicine practitioner, Raman Singh, surrounded by National Security Guard commandos, drove to the police ground along with his entourage of black Safaris to board a waiting helicopter for Kusumi in Bemetra assembly constituency to address a poll meeting. Talking to PTI inside his chopper, the chief minister sounded confident about the elections, saying polling was going on peacefully with long queues of people standing outside poll booths. "Initial response is very good and encouraging," Dr Singh said early in morning. "Polling in naxal-affected Bijapur, Dantewada and other places is going on and the way people are taking part in it shows that they are not deterred by naxal-violence," Dr Singh said. People are coming out courageously to vote and initial trends are encouraging and we will win more seats than the 2013 assembly polls in these naxal-affected areas, he said. The Election Commission later announced in the evening that the first-phase of polling recorded voter turnout of over 70 per cent. 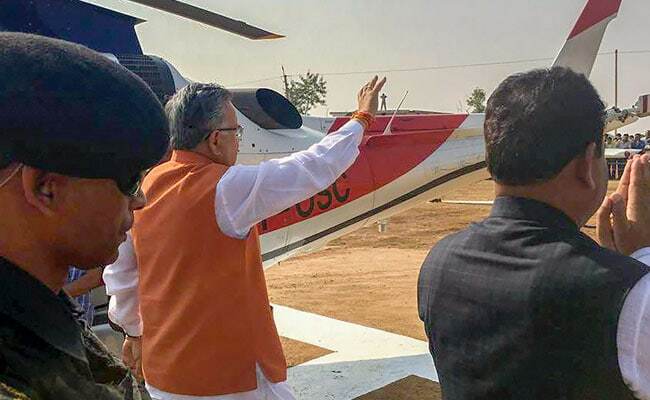 As the chopper was to reach its destination, Raman Singh looked down to see the waiting crowd and cited "a strong foundation of basic infrastructure created by his government in the last 15 years that was now ready to take a long leap of development". Out of his helicopter, the chief minister was greeted by a large enthusiastic crowd, including women, raising slogans like 'mobile wale baba ki jai' - referring to a scheme under which as his government is said to have distributed free smart phones to 30 lakh people in the state. At other places, Dr Singh was greeted as 'Chaur wale Baba' for distributing rice at Re 1 per kg, a scheme aimed at gaining a strong foothold among the people in his 2008-2013 stint which proved a game changer in the Chhattisgarh politics. The state is known as 'Rice Bowl of central India'. Addressing a public meeting, Dr Singh did not miss the opportunity to take a jibe at the recent alliance between the BSP and Ajit Jogi's party, the Chhattisgarh Janata Congress. "For the first time I have seen the alliance between hathi (elephant) and a farmer carrying a plough," he said. "Normally plough is associated with a pair of ox, but here in Chhattisgarh it is joined with an elephant," Raman Singh said as people laughed at his jibe. After the public meeting, Dr Singh held met local leaders and also enquired about attendance in rallies of top central leaders of the party. After being told by his aides that the chopper was still being refuelled, Dr Singh said he should have been told earlier about it so that he could have further addressed the gathering. As he waited for the chopper to get ready, the BJP workers took selfies with the chief minister. Back on his chopper soon after, Dr Singh waved at the crowd and proceeded for his next poll meeting.